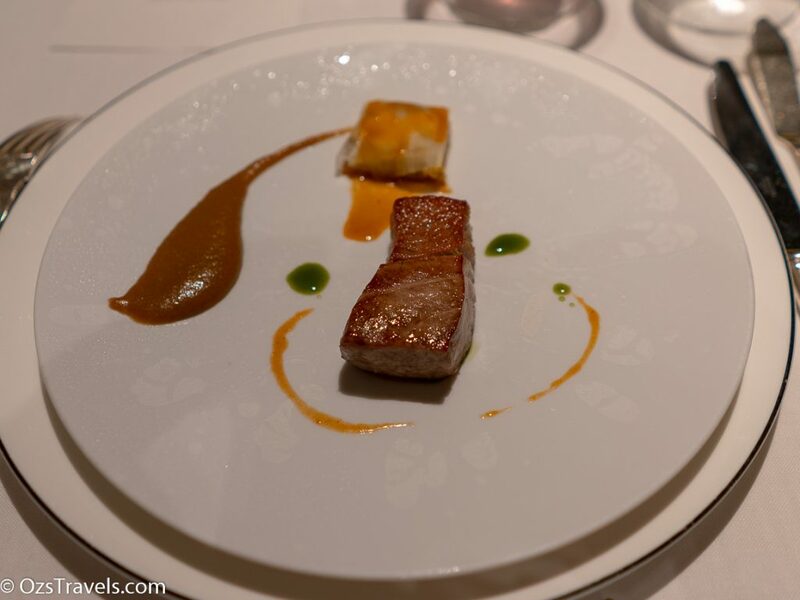 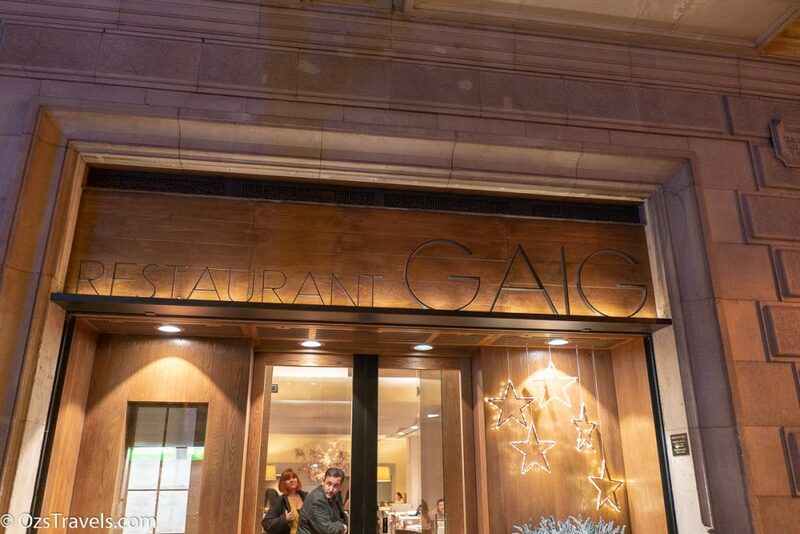 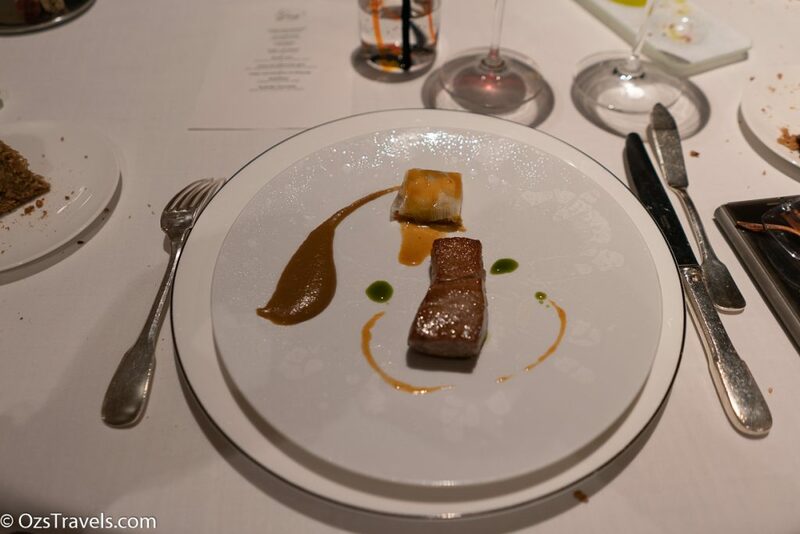 I recently had the privilege to eat at Restaurant Gaig in Barcelona Spain. 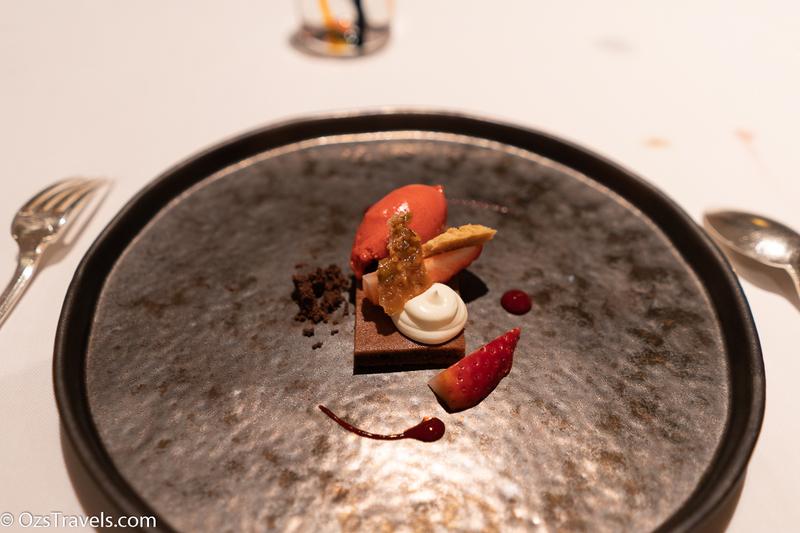 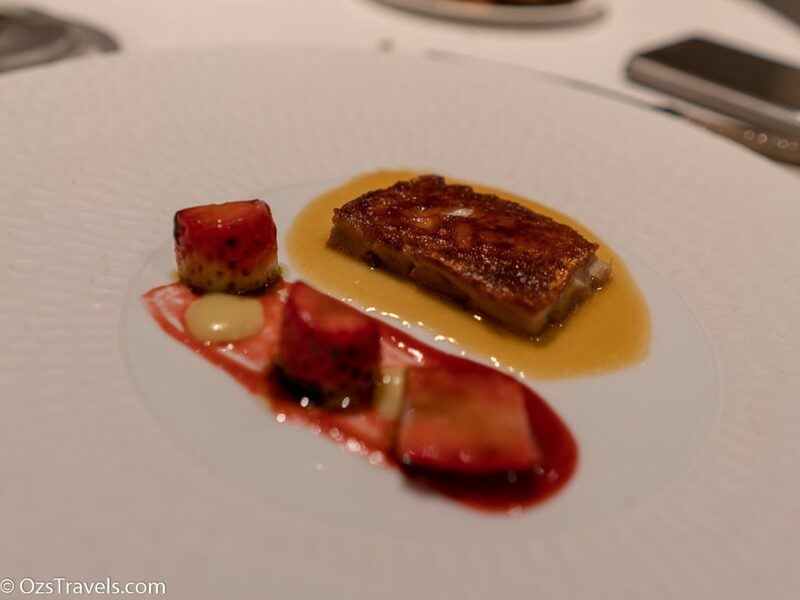 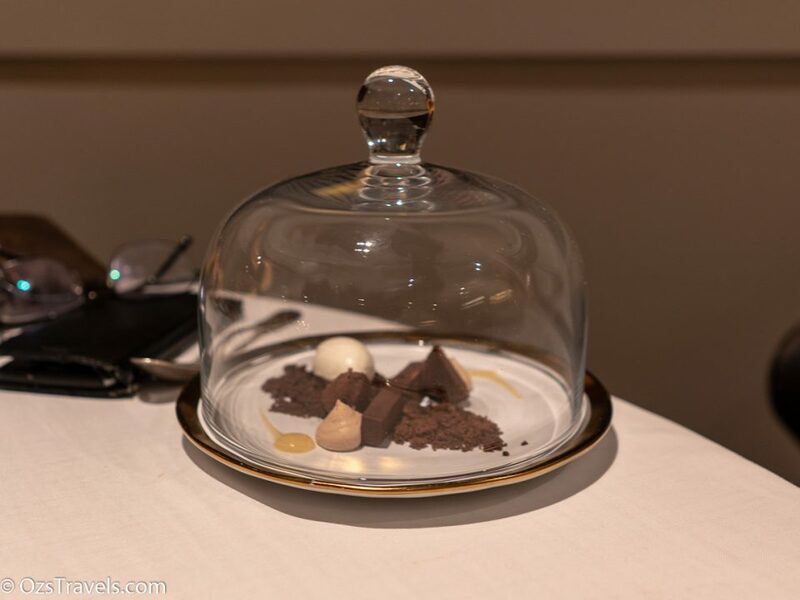 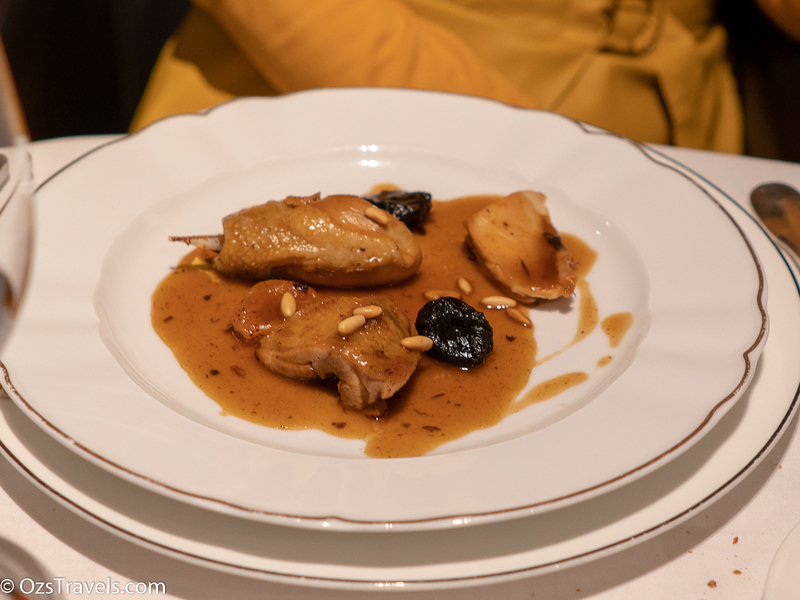 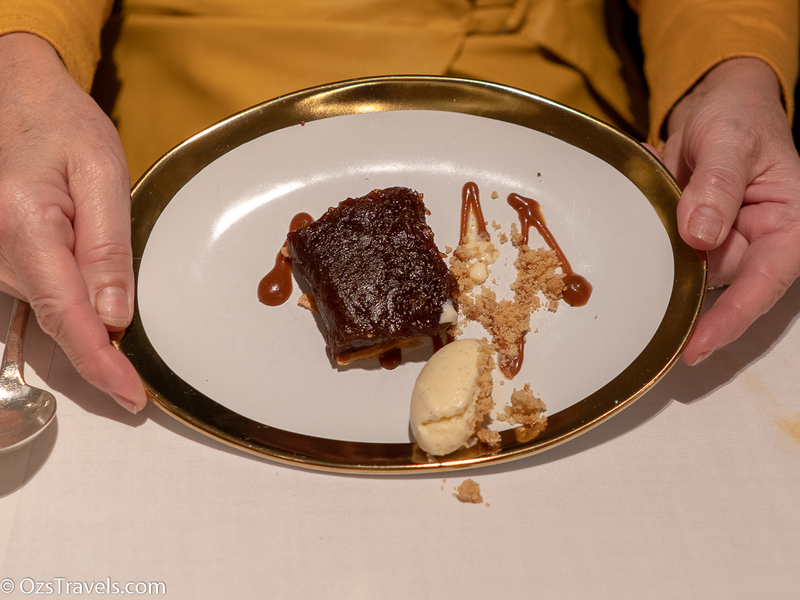 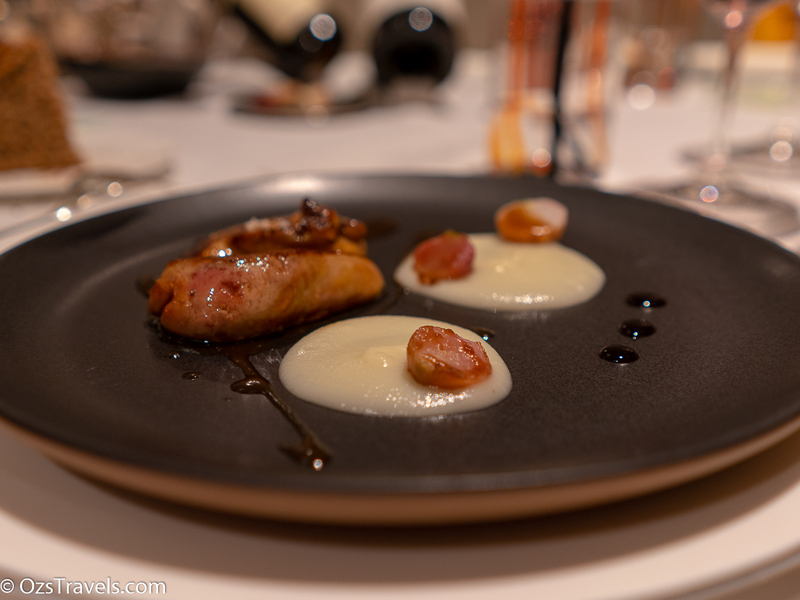 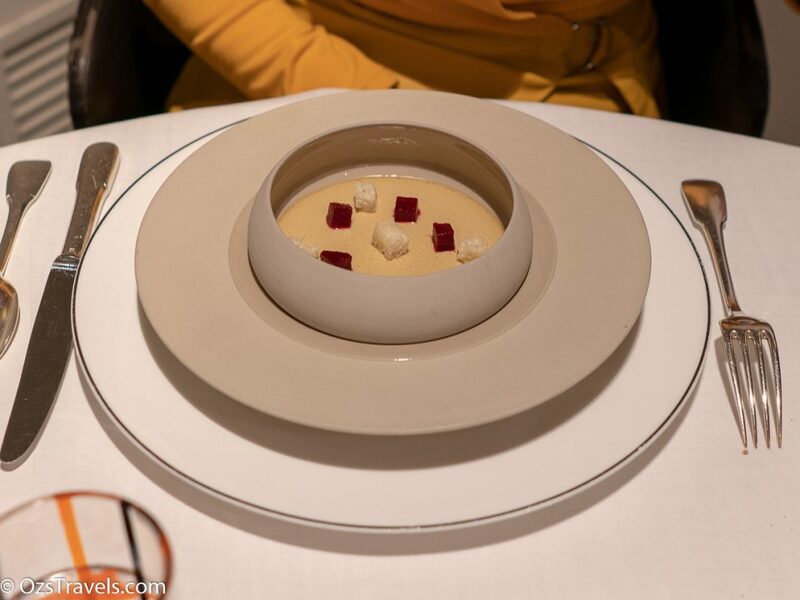 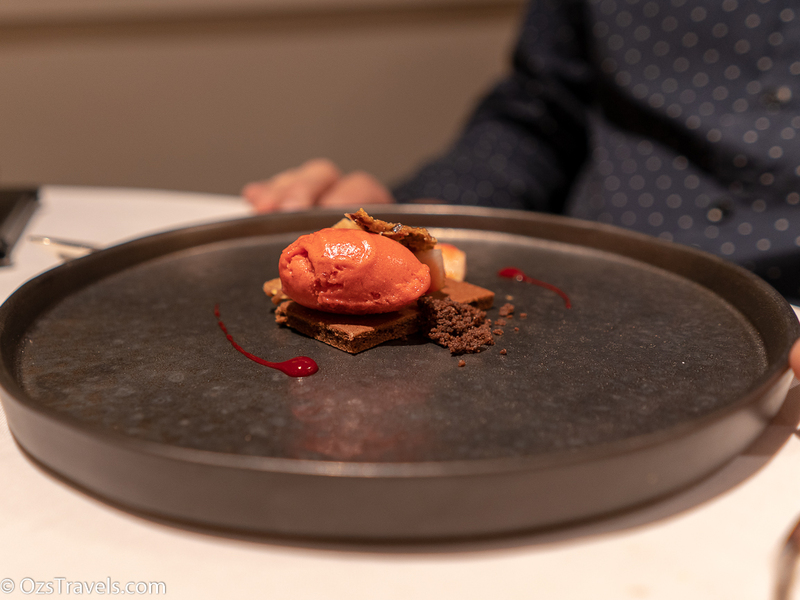 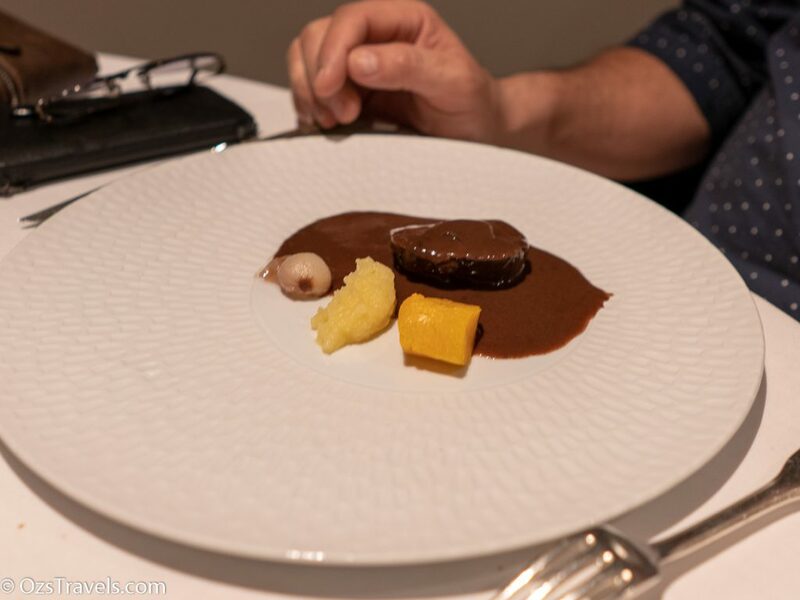 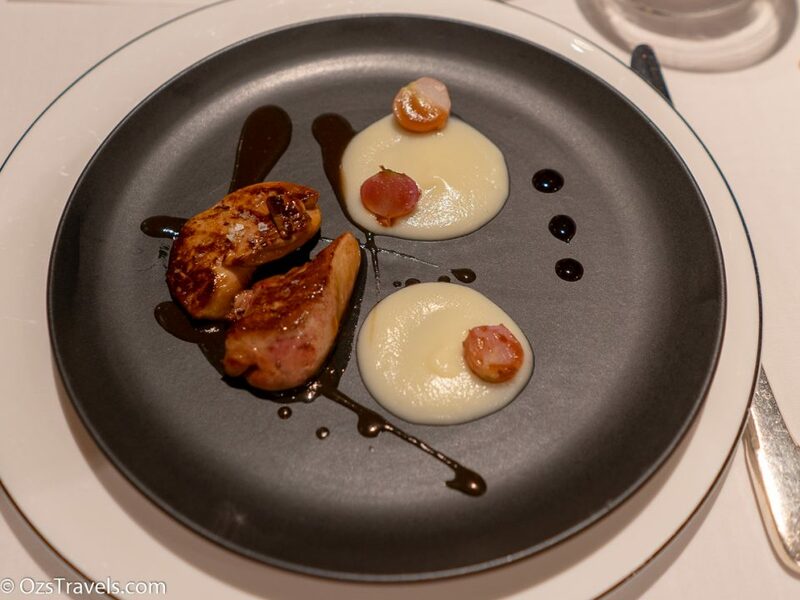 Gaig Singapore is one of my favourite restaurants and so, with the help of Nuria the daughter of Charle Gaig the acclaimed Chef I was able to get a booking for dinner. 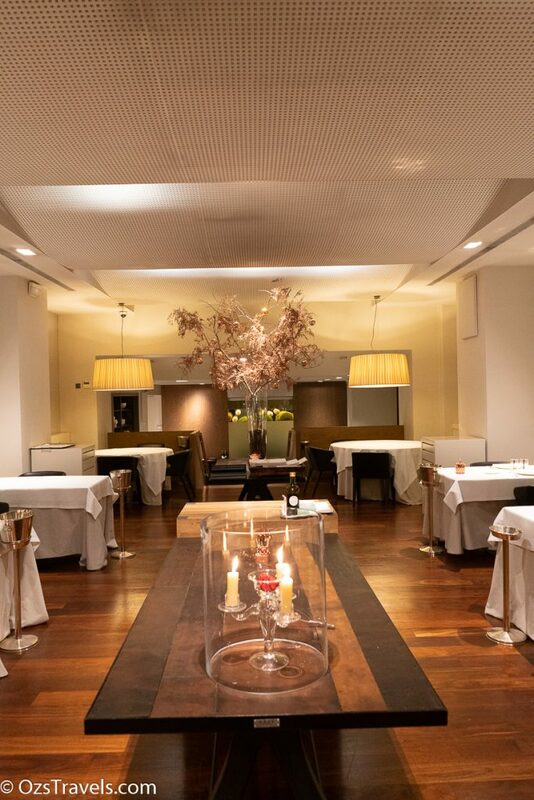 First impressions of Restaurant Gaig is that this is a classy joint. 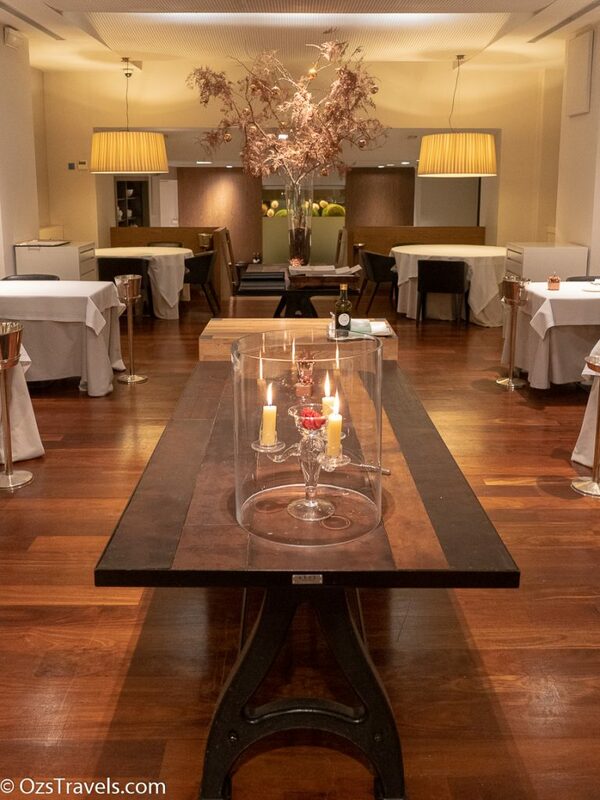 Everything about the place, the greeting how we were escorted to the table, the décor made it clear we were in for a very special night. 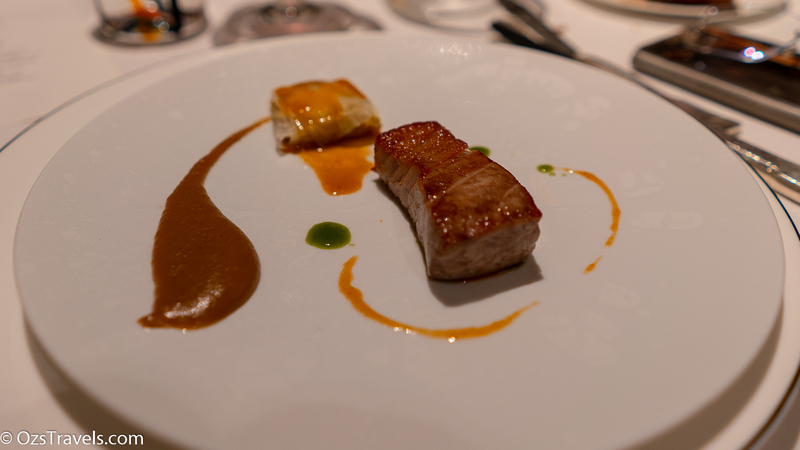 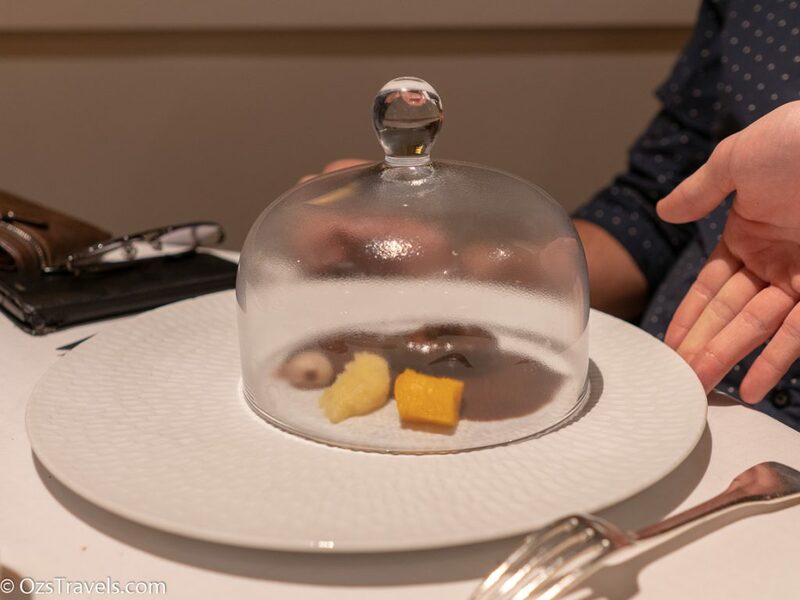 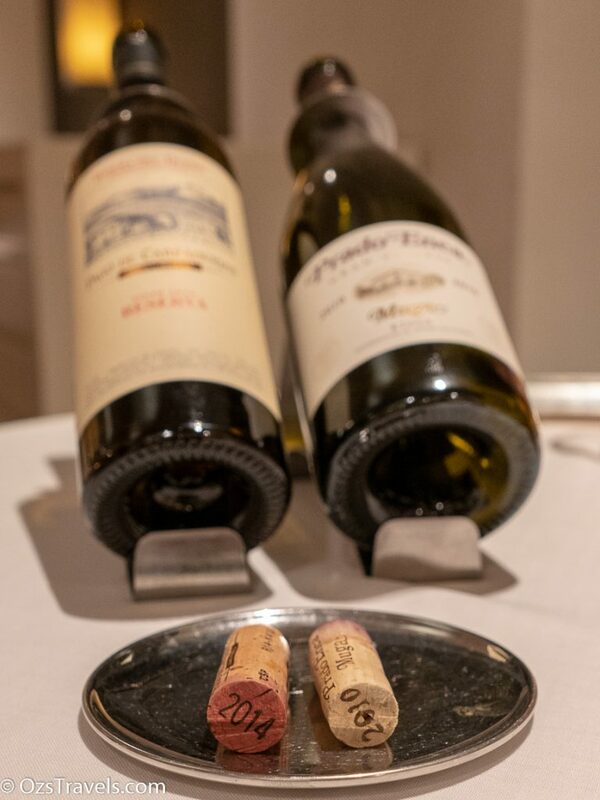 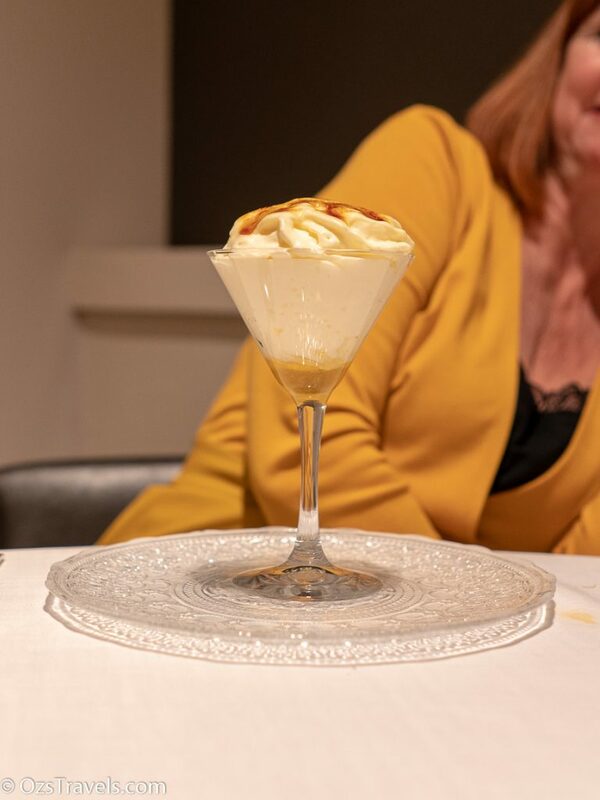 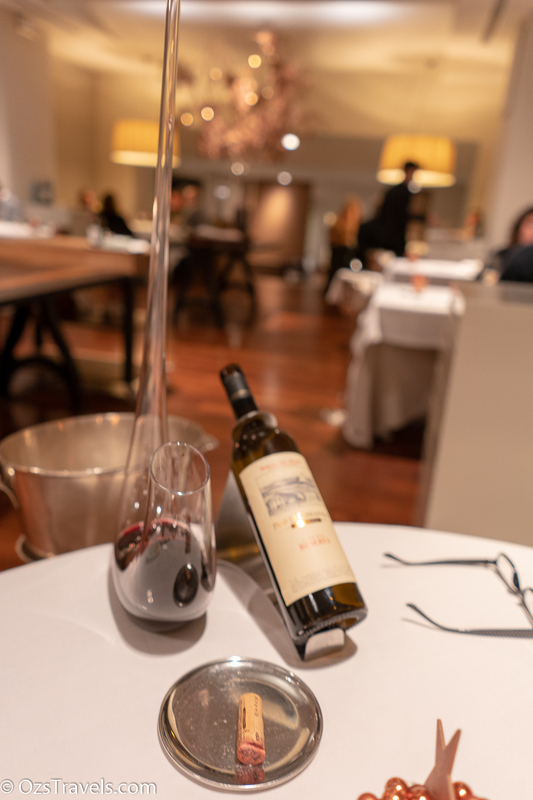 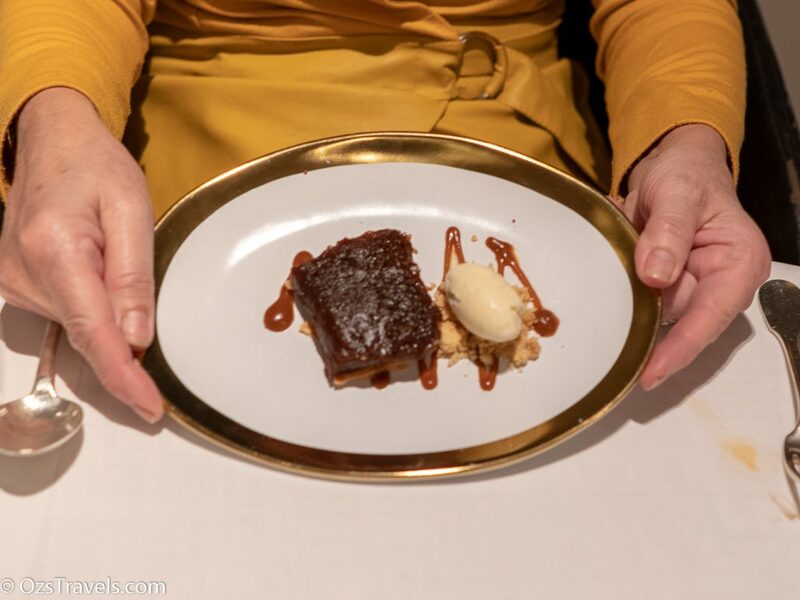 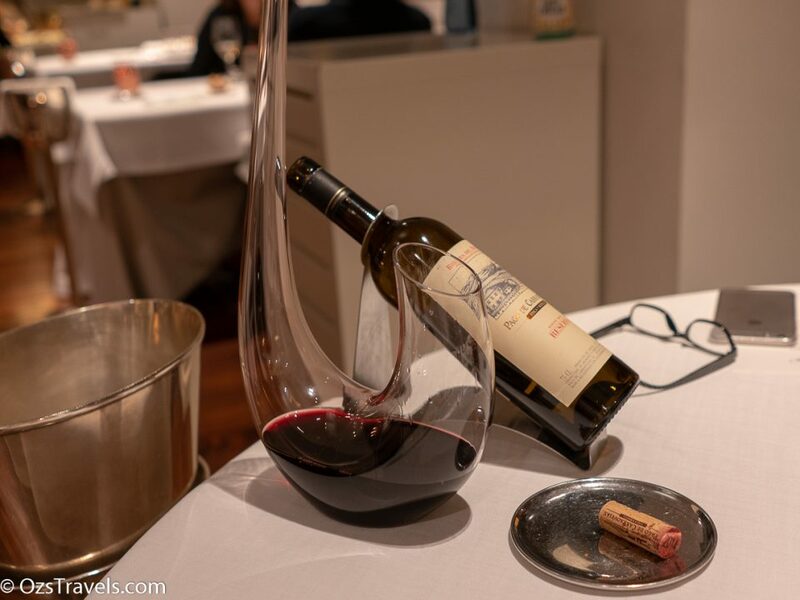 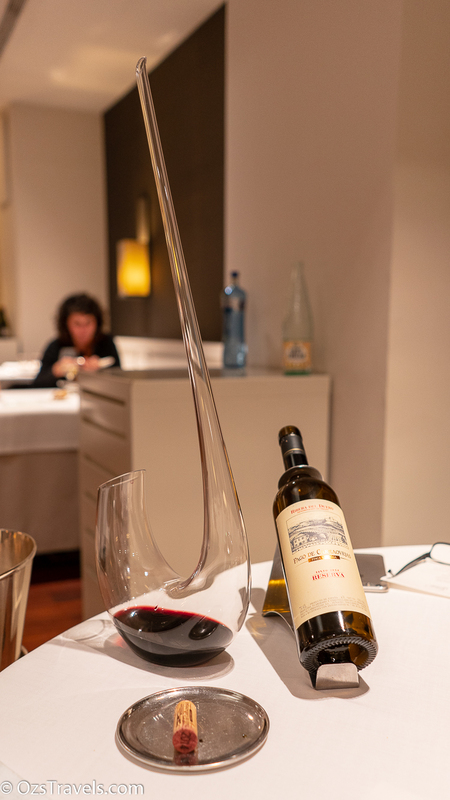 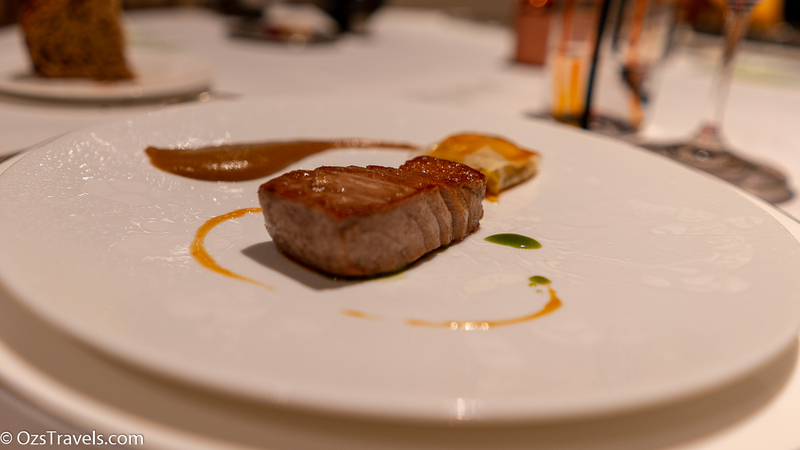 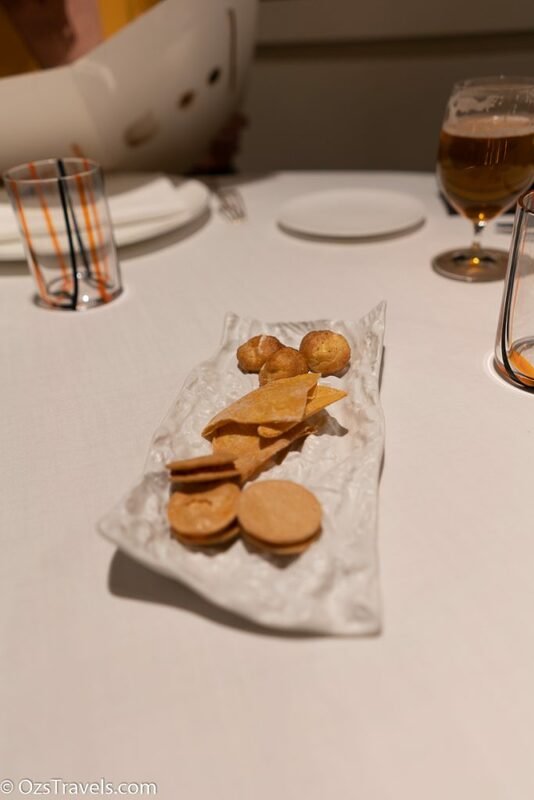 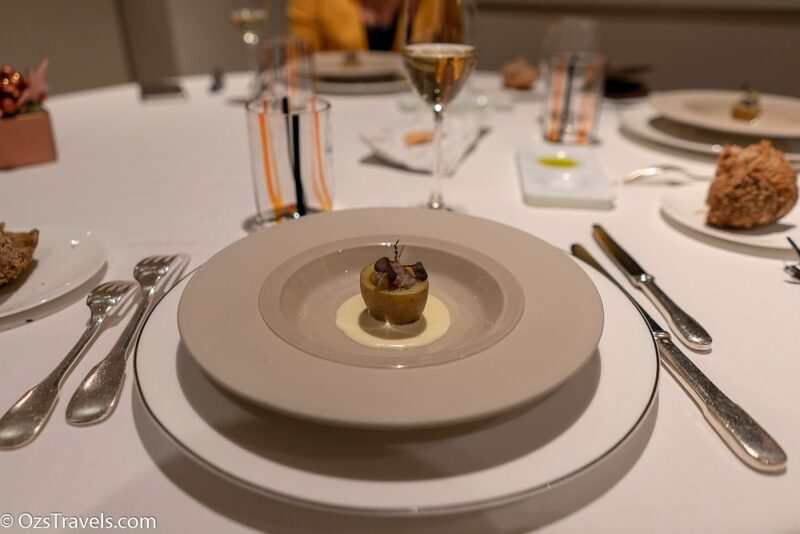 At Restaurant Gaig there are few options to make at the start, à la carte, or one of two tasting menus the Traditional Menu, 7 courses, and the Gran Àpat menu, 9 courses . 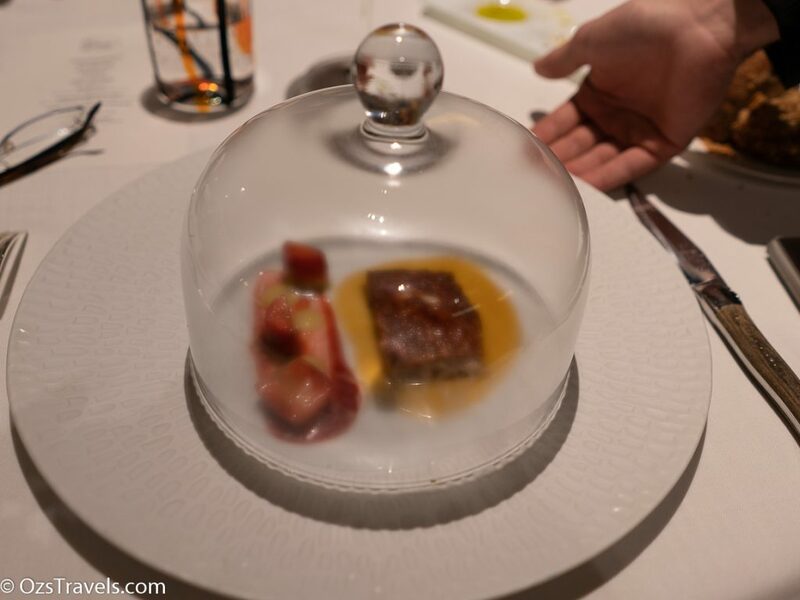 It was not really a hard choice for me, I chose the Gran Àpat menu. 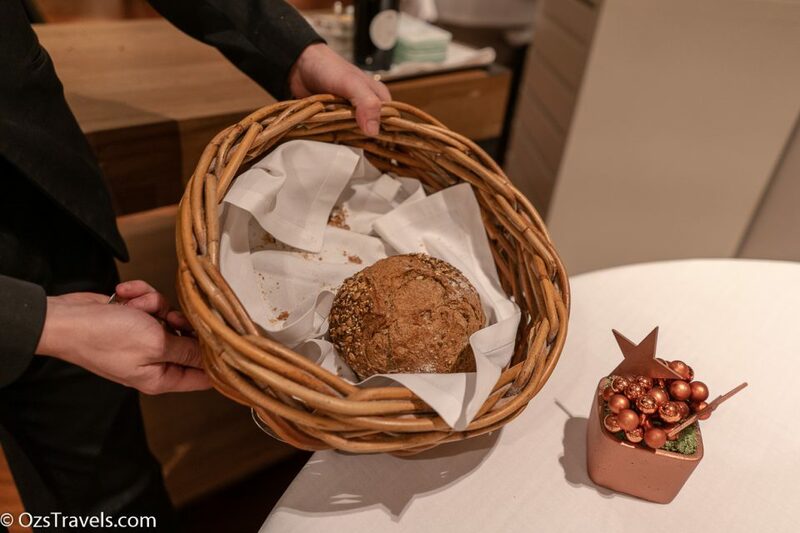 The freebies, lovely bread, interesting crackers and stuffed spud, loved it! 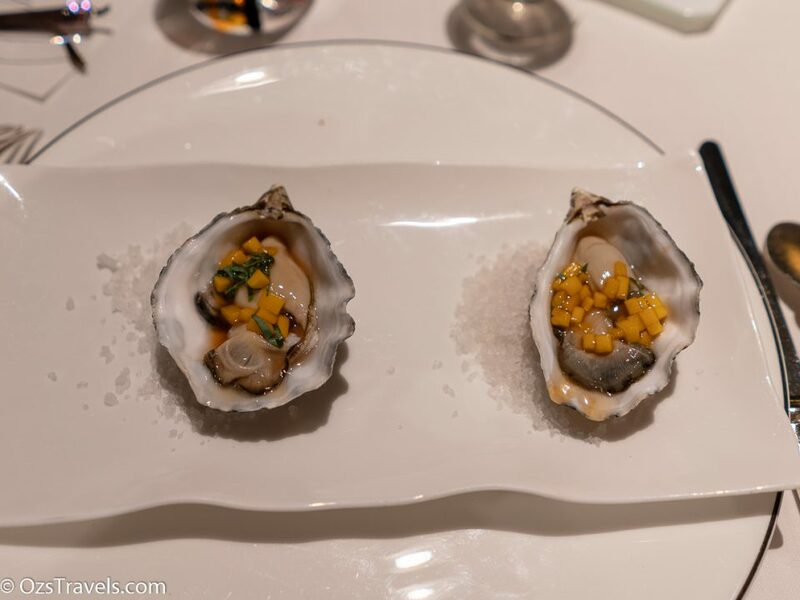 Oysters from Marennes and pickled mango – Nice oysters, not a big mango fan, enjoyable, nice start. 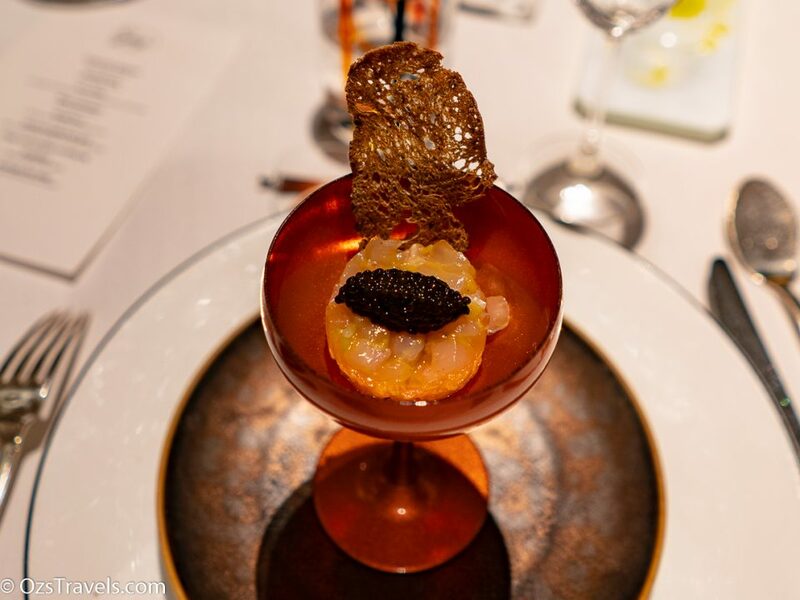 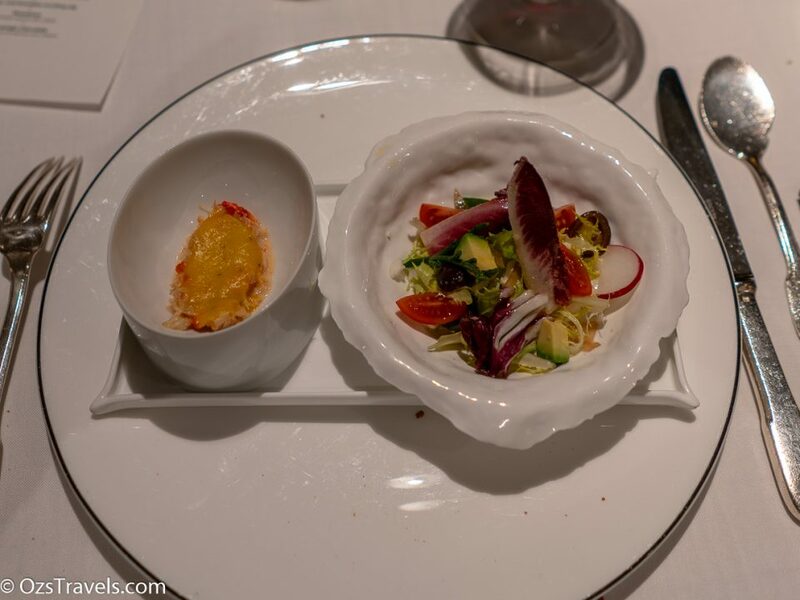 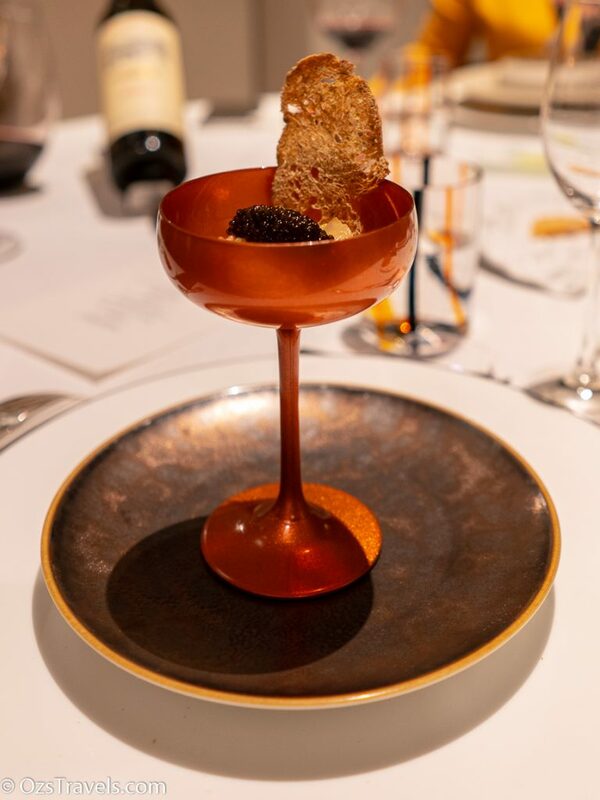 Sea bass tartar with imperial caviar – Yum my favourite dish! 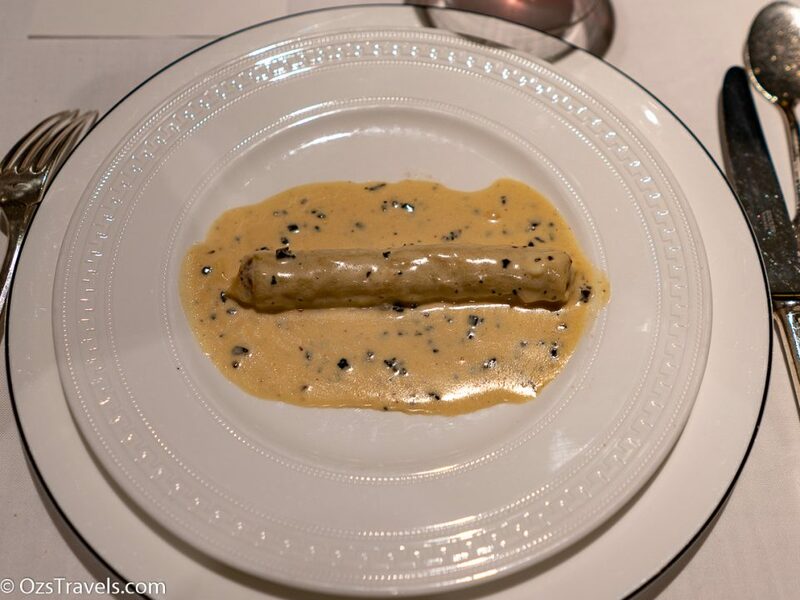 The caviar was beluga caviar, a first for me. 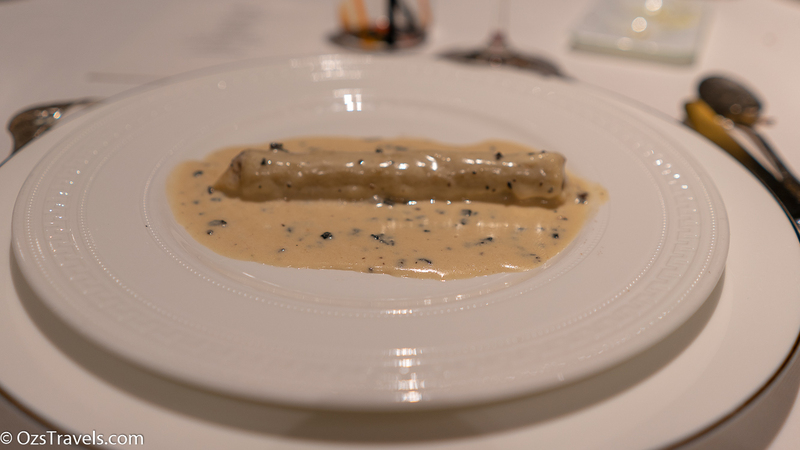 Gaig’s cannelloni with truffled sauce – As always excellent. 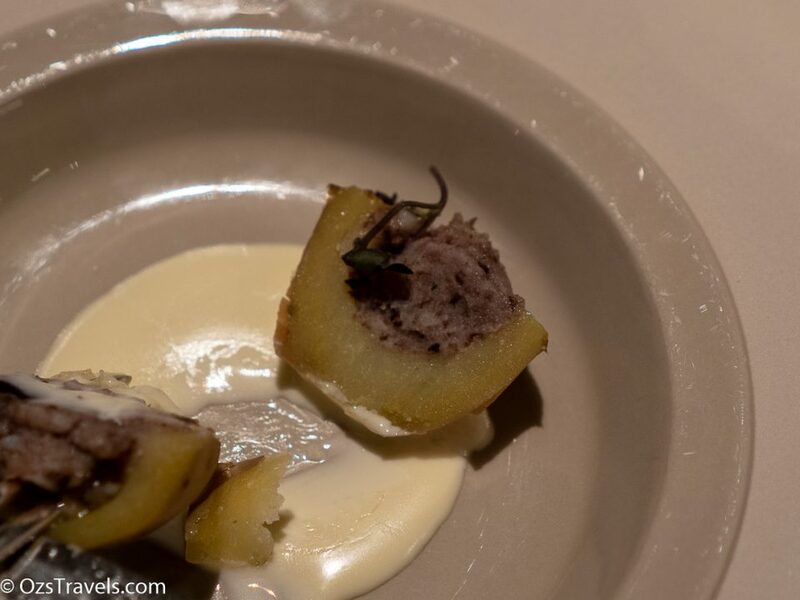 Really loved this dish, love the flavours and texture, plus there are truffles!! 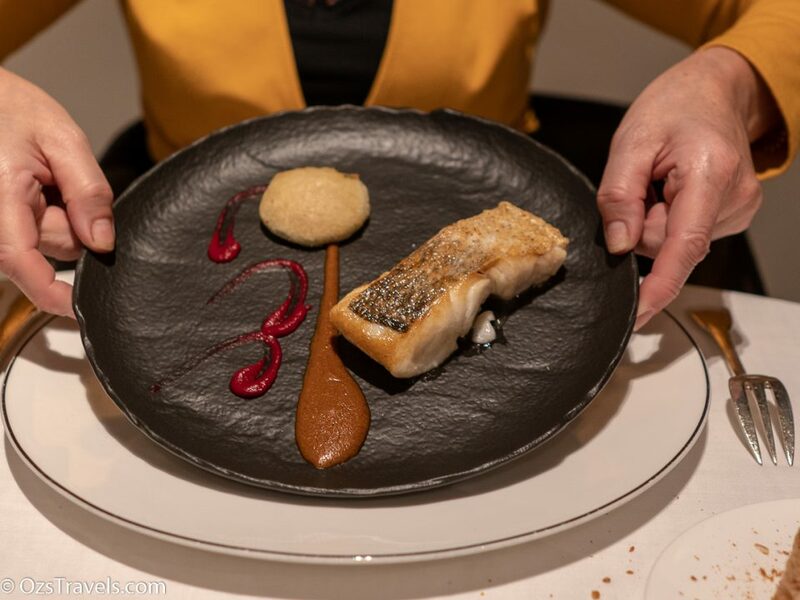 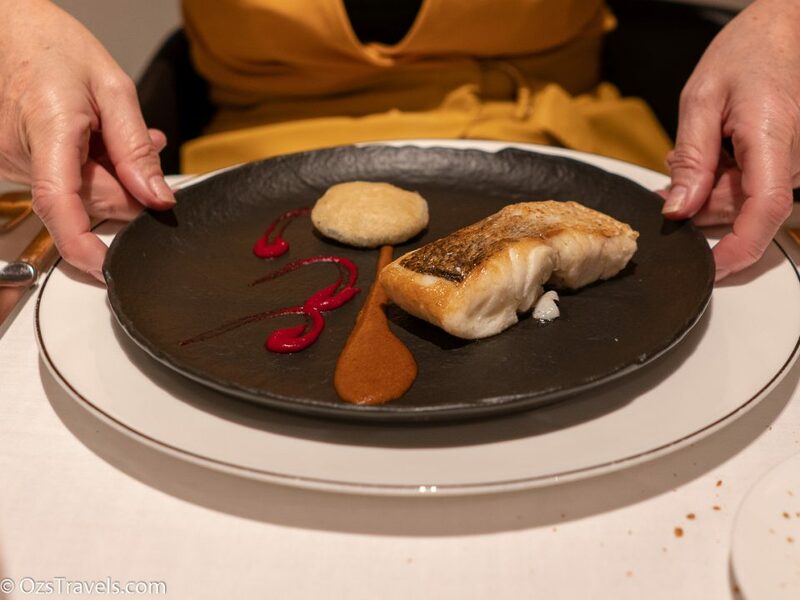 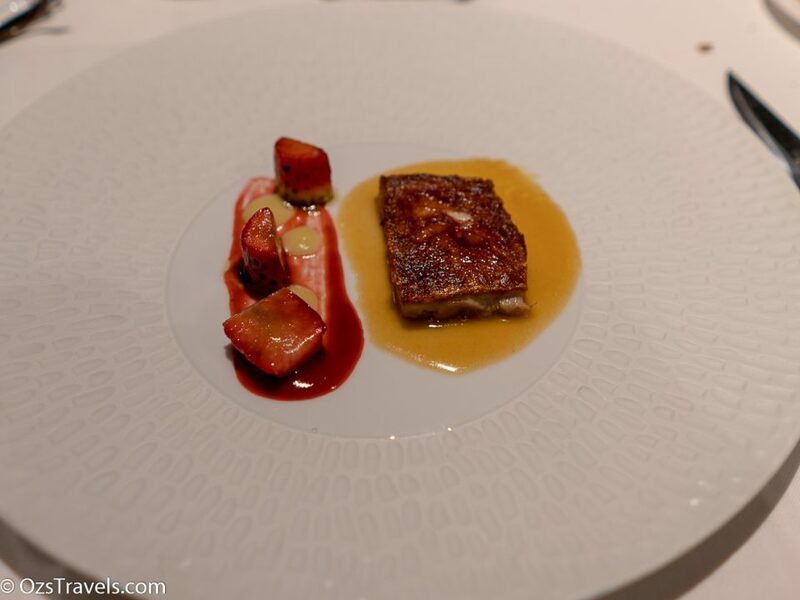 Hake with “all cremat” sauce, zucchini and beetroot – This was on the Traditional menu and was very tasty. 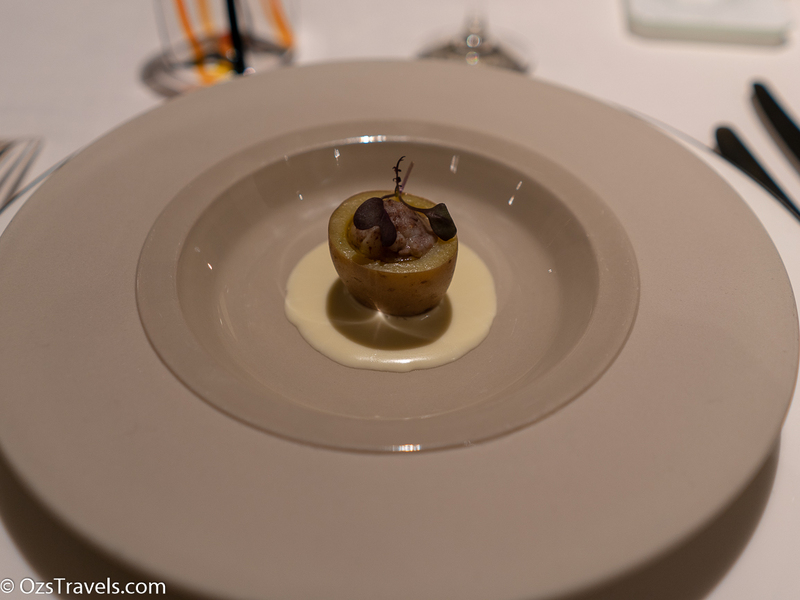 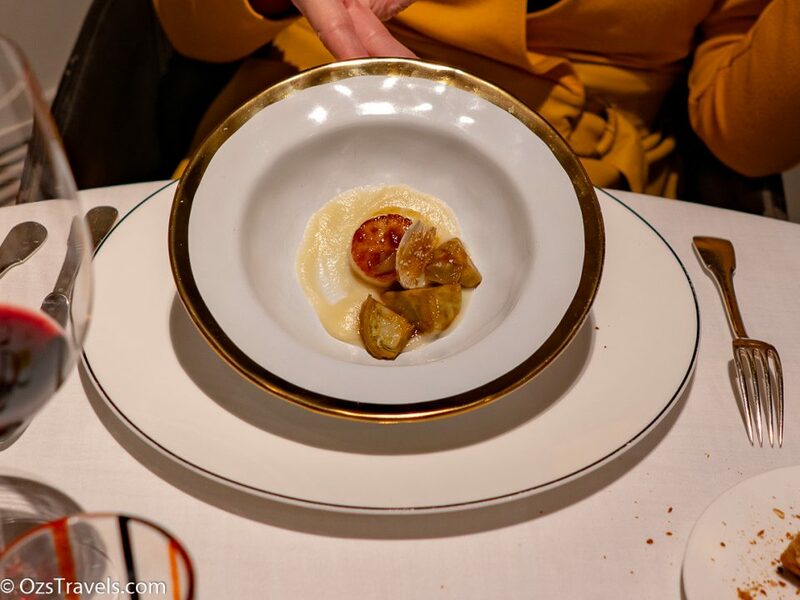 Sea scallop Jerusalem artichokes cream and roasted artichokes – The Traditional menu dish, looked great and tasted the same! 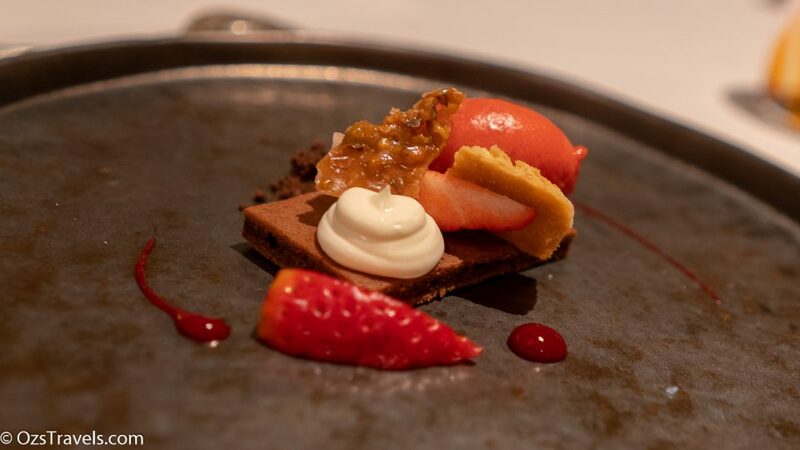 Strawberry cheese and butter sablé – Love it, great combo, nice way to start the dessert COURSES!! 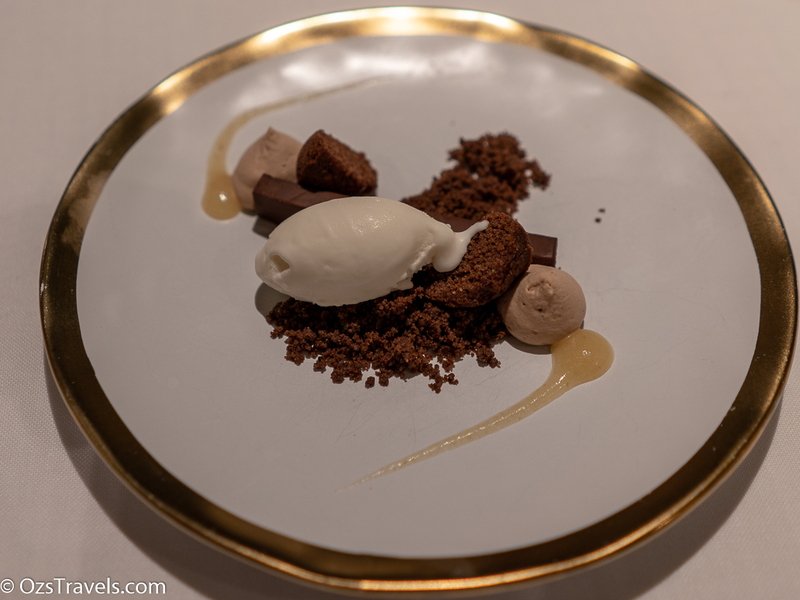 Guanaja chocolate pear and cinnamon ice-cream – I saved this to last, well did not get a choice as it was served separately 🙂 Great dish! 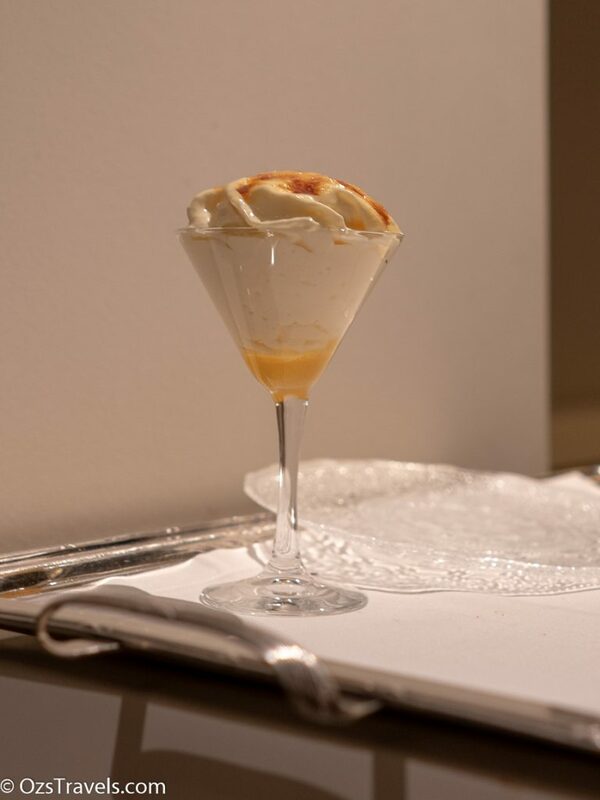 Our Catalan crème brûlée foam, toffee and lemon – One of my favs!! 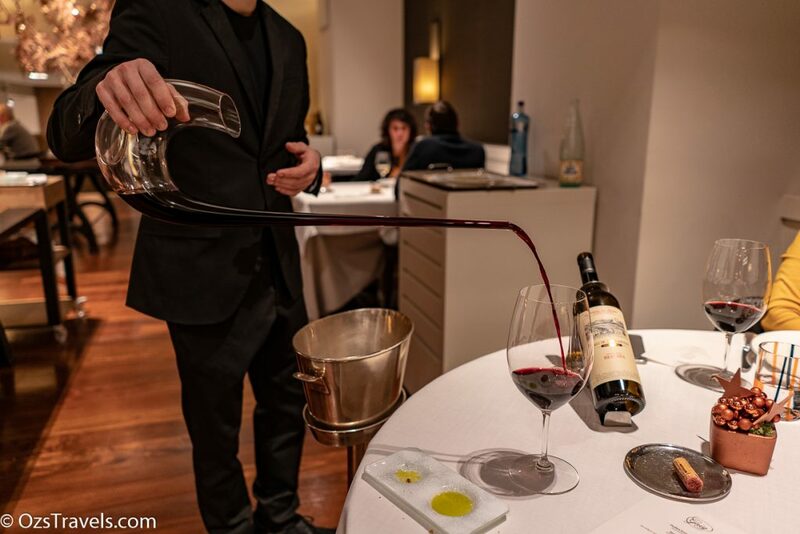 As you would expect the wine list was extensive mainly Spanish, the resident sommelier was very helpful, which is great as I didn’t know where to start. 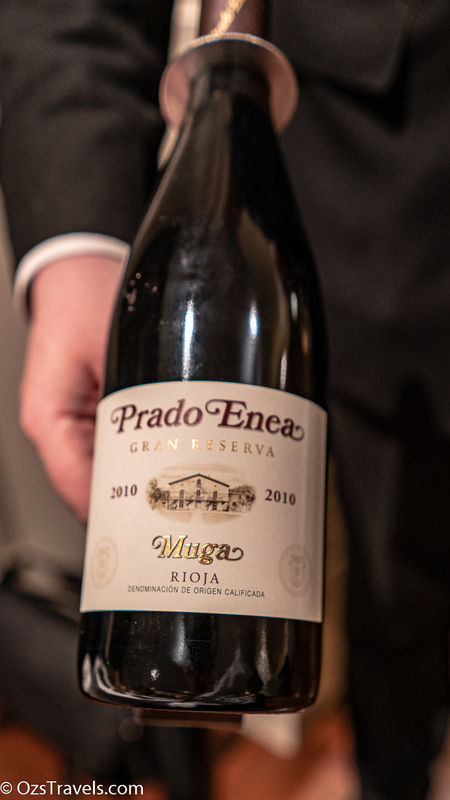 I am guessing that this bottle had a couple of faults, but was still enjoyable. Looking forward to giving this another taste. 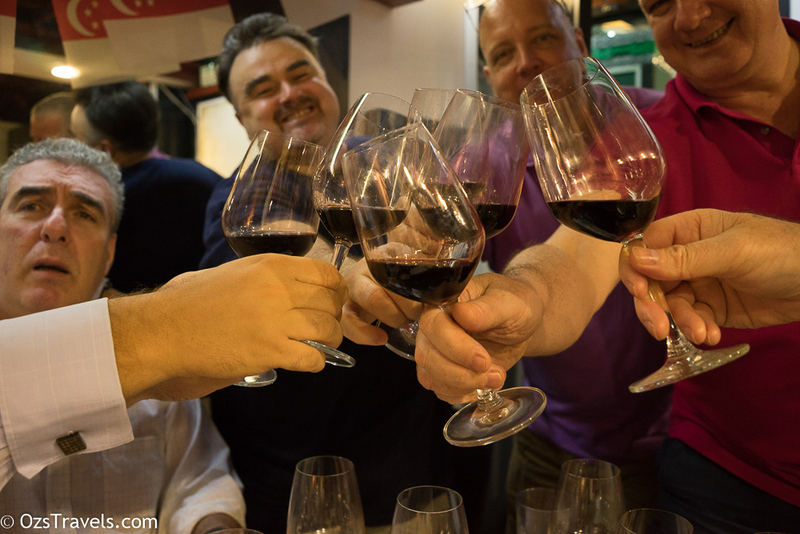 When in Spain what does one have to drink after dinner? 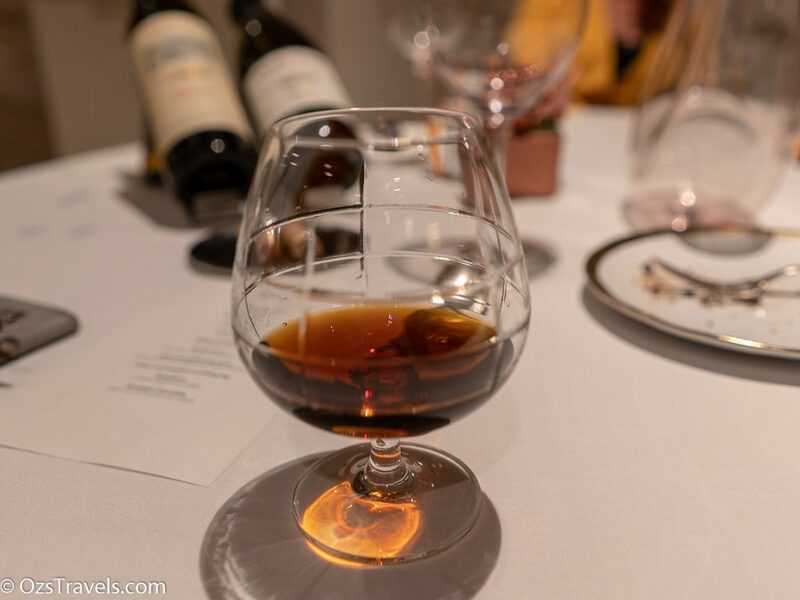 A Spanish Brandy of course and as we are were in Restaurant Gaig we needed a special one. 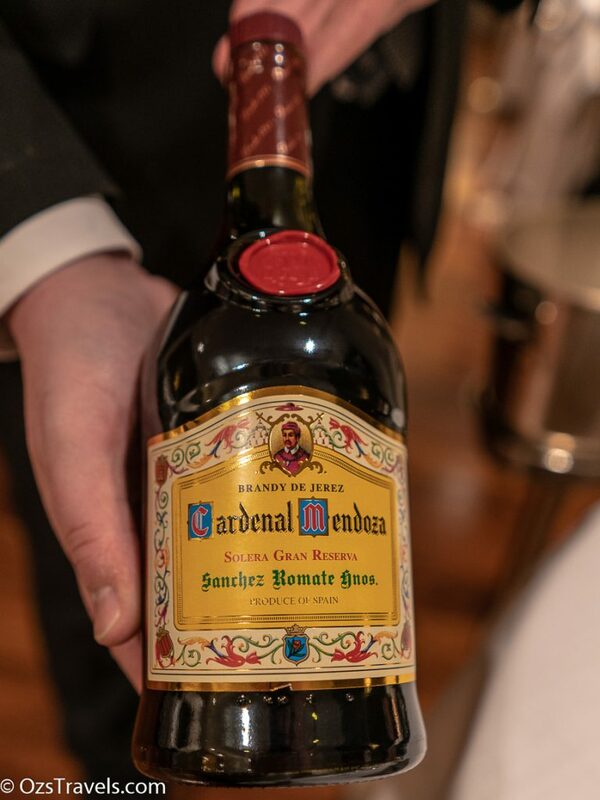 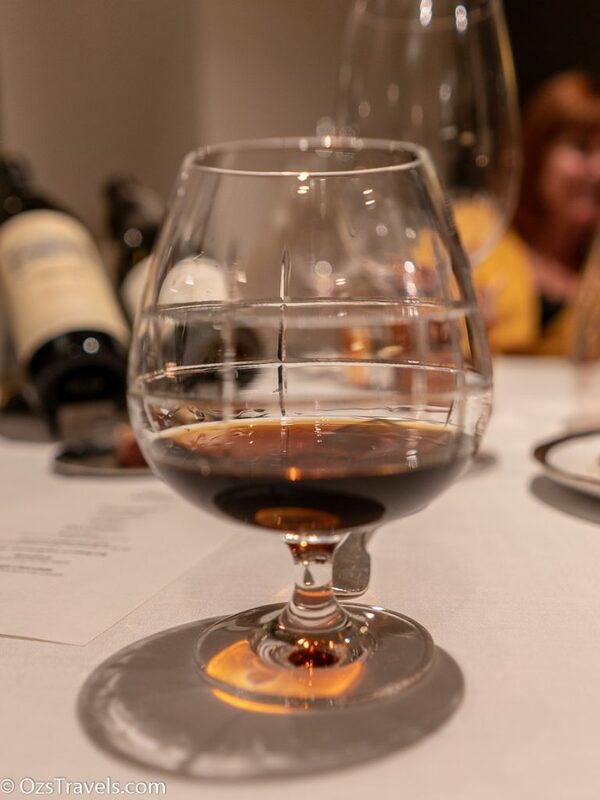 Cardinal Mendoza Solera Gran Reserva is aged for around 15 years in Oloroso and Pedro Ximénez sherry casks which gives it deep amber appearance with raisin and sherry aromas and a smooth palate. 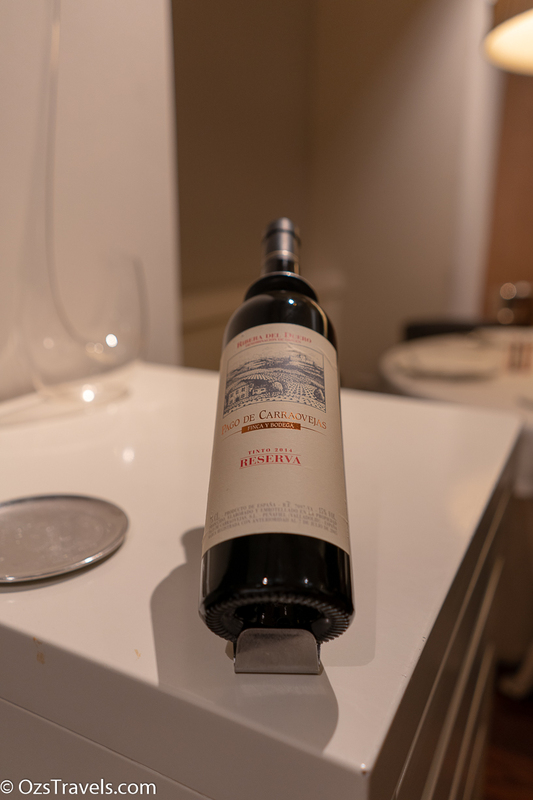 Great drop! 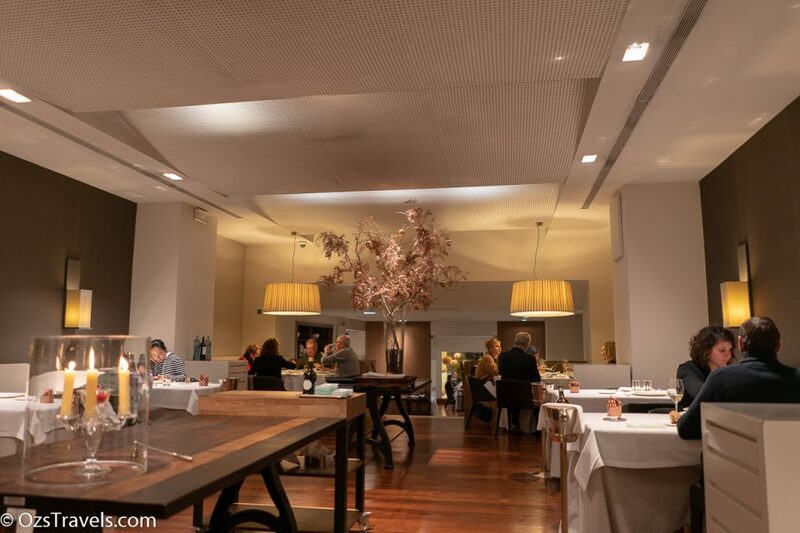 Restaurant Gaig is definitely a place to visit in Barcelona and somewhere I am planning to return to, dining there is a gastronomic experience not just a meal. 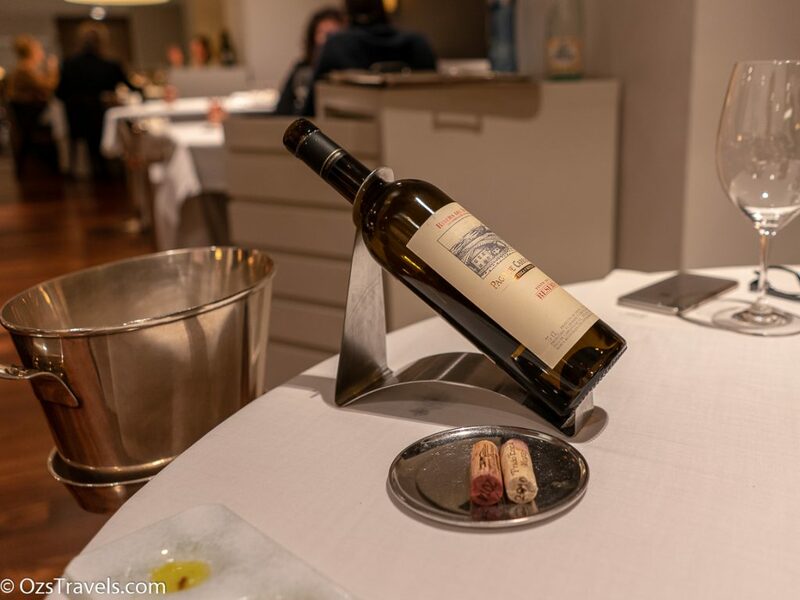 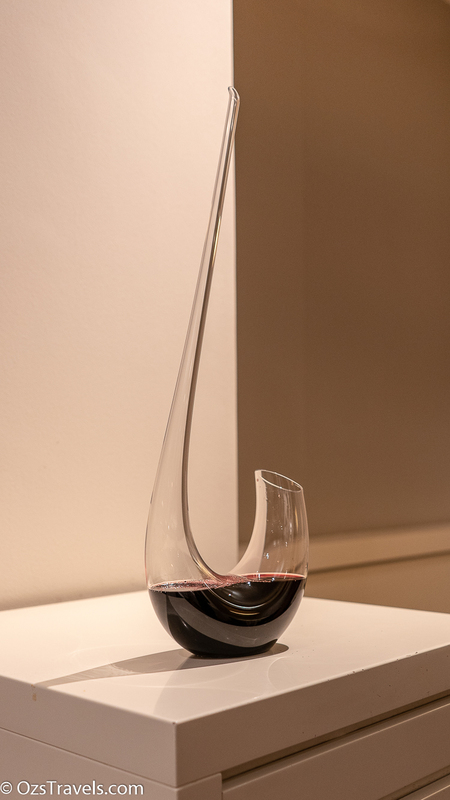 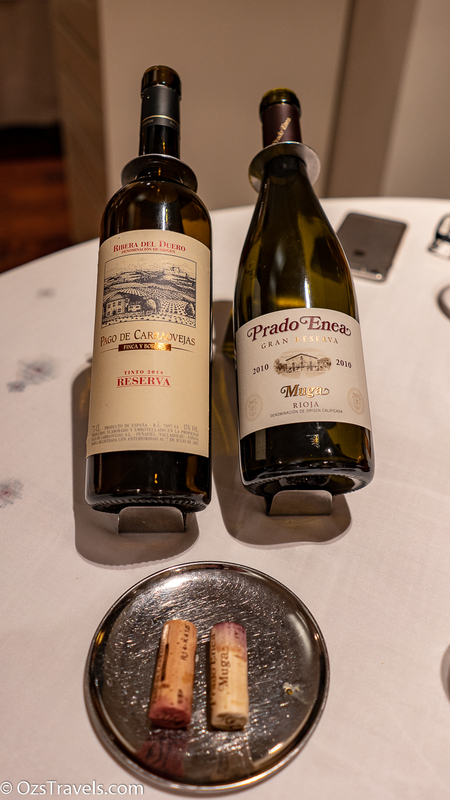 When I remember my visit to Restaurant Gaig I will remember the amazing food, excellent service, great wine in a comfortable but elegant decor.